Denise Archuleta, co-founder of Facing Our Immortality, has been writing about her cancer experience since late 2009. Her blog is named because she felt like a “nobody” when she was diagnosed with stage IIIC ovarian cancer July 29, 2009. After finding very little online support, she created this blog to journal her life with cancer. The name “Nobody Has Ovarian Cancer” came as a result of believing there was misdiagnosis, being told three times she was too young to have ovarian cancer. Denise explains that she felt like a “nobody”. This blog is honest and not always presenting a woman of hope and joy. What it does represent, however, is how one can be transformed by the grace of God. It reveals the importance of family, of love, of faith and prayer. 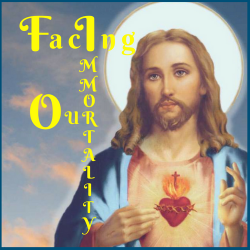 The history behind Facing Our Immortality is written in this blog. We are evolving into a true cancer ministry, which is the Will of our Lord. Praises to God. To read Denise’s blog, click here.